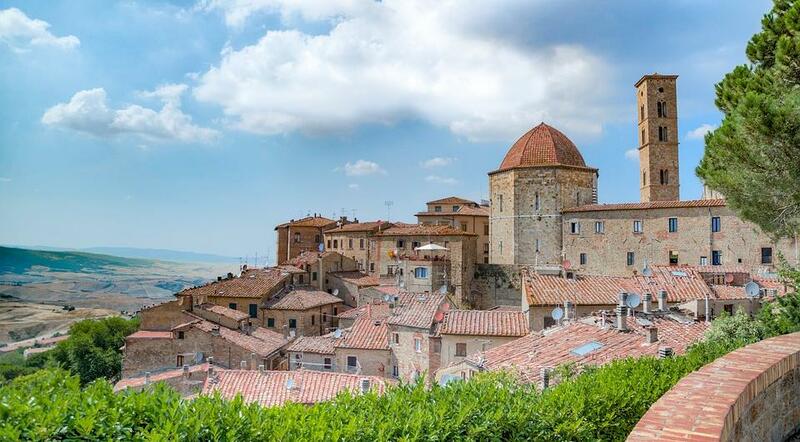 Are you planning a visit to Volterra and you are not sure about what you should see first? Here you’ll find 4 different things to do in the small, ancient city and everything you need to know to plan your visit. The site where the modern Volterra is found has been continuously inhabited as a city since the end of the 8th century BC. At the time the hill top town was called Velathri (or Vlathri), but later the Romans gave to the town its modern name by renaming it Volterrae. Even if Volterra seems the classical Italian medieval town, it is rich of artifacts that testimony its Etruscan times, such as the city walls – built in the IV century BC, the Acropolis – where you can find the foundations of buildings, temples and cisterns, and Porta all’Arco – the only door of the city walls entirely preserved from Etruscan times. But if you want to discover almost everything there is to know about Volterra and its Etruscan past the Guarnacci Museum is the place for you. The museum is divided into two parts, an ancient part that preserves a XIX century style of exposition, masterfully contrasted with the more modern and more explicative part. Here you can find an impressive amount of archeological treasures and discover what is the meaning and history behind the peculiar long statue frequently associated to Volterra: the Ombra della Sera (Shadow of the Evening). Not too far from the town center you can also visit the Etruscan Necropolis. Volterra is mostly renown for the fine craftsmanship of alabaster, a tradition that comes from the Etruscan that used alabaster to make cinerary urns. But if you want to discover more about this translucent mineral you can look for a real workshop (several are open to tourists) or go to the Alabaster Ecomuseum. The museum tells the history of the alabaster crafts from the Etruscan to present times, it shows the excavation process, the different varieties of alabaster, the artisans’ techniques, the trading of sculptures and objects and also the story of the travelling artisans who brought alabaster crafts in every part of the world. As we said before, despite its Etruscan origins, Volterra has the appearance of a Medieval Town: the old cobbles in the streets, the impressive city walls, the Fonte di Docciola and the multitude of towers in every street. 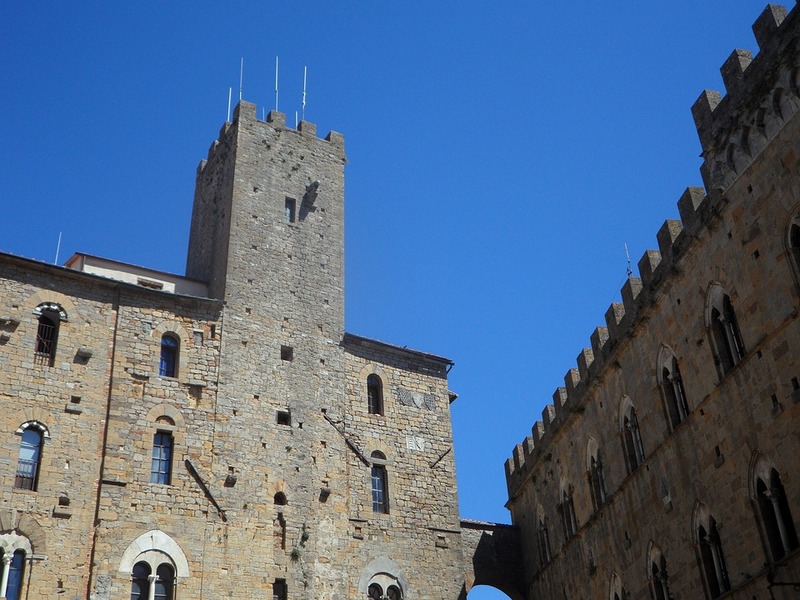 Just walking around Volterra is sufficient to admire the Medieval architecture and constructions, but if you really want to experience the flavor of the Middle Ages, you have to visit Volterra during two specific Sundays of August (generally the 2nd and the 3rd). During these days the city center of Volterra becomes a true Medieval town with people, animals, musicians, shops and everything else. During the Volterra AD 1389 re-enactment you can taste the Medieval street food, admire a real blacksmith in action or an impressive tournament with bowmen, lances and horses. To be honest, everything tastes delicious in this land: wine (we are so close to Chianti or Vernaccia area), cheese, mushrooms, wild boar (“sweet and spicy wild boar” is a traditional recipe of Volterra). But the truffle is the king of Volterra Food&Wine: “il Marzuolo”, the March truffle , “il nero”, the black Truffle, which grows in Summer and the most precious of all “il Tartufo Bianco” (White Truffle) which grows in Autumn. Between October and November in Volterra takes place also one of the most important fair of Truffle in Italy: Volterra Gusto. And if you are interested in local, delicious food, you must participate in the “Cene Galeotte” (Dinners in Jail): a re-integration project for incarcerates. Once a month, in the local prison, one famous chef coordinates a group of prisoners, preparing a special dinner for more than 130 people. The dishes are local and generally superb, and the money collected is for a good cause. Try it, if you can!